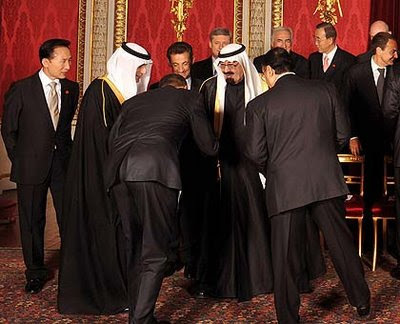 Despite President Obama's bow to the Saudi king during the G20 summit in London earlier this month, King 'Abdullah remains concerned about the new American president and his overtures to Iran. Saudi Arabia faces several threats in the Persian Gulf region. 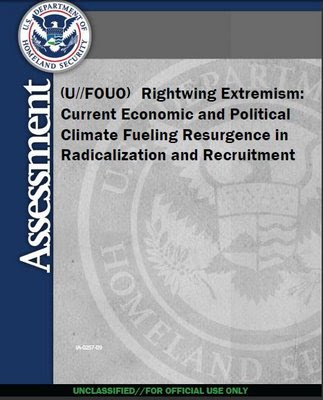 These threats include terrorist attacks from al-Qa'idah and other fundamentalist Islamist groups and attacks on the oil infrastructure from Shi'a separatists in the Eastern Province, but the most serious threat by far is the ascendancy of Iran as a major power broker in the region. The Persian Gulf is not a large body of water. It is all that separates the two key players in the region - the Islamic Republic of Iran and the Kingdom of Saudi Arabia. Both are essentially Islamic states, one an adherent to the strict Wahhabi school of Sunni Islam, and one following the strict tenets of Twelver Shi'a Islam. Both sit on enormous oil reserves. 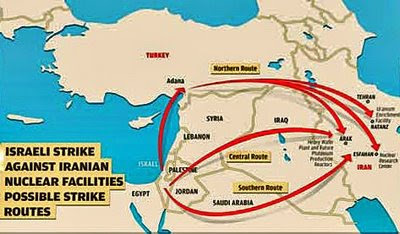 One - Iran - is attempting to acquire nuclear weapons and the missiles to deliver them throughout the region. 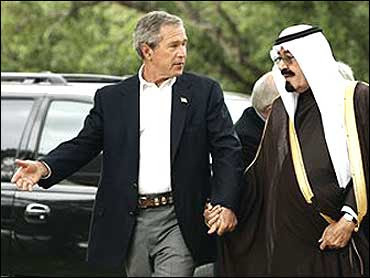 The other - Saudi Arabia - had been relying on its relationship with the United States for its national security. That calculus changed shortly after the new American president took office and made it clear that he wants to change U.S.-Iranian relations. That change will likely be at the expense of the Gulf Arab states, long-time American allies in the region. 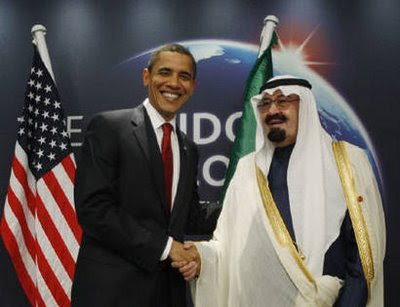 Although Obama said during his campaign that an Iran with nuclear weapons was "unacceptable" and the world should take steps to prevent that from happening, the Saudis have concluded that the talk will not translate into effective action. While the West talks to Iran, Iranian centrifuges continue to enrich uranium in defiance of the world - that very world that the president hopes will prevent the development of a bomb. Did we learn nothing from North Korea? What are the Saudis to do? Given their enormous wealth, they might try to buy a nuclear capability, much like they purchased virtually every other military capability they have. They might enter into a strategic alliance with the United States, hoping to fit under the American nuclear umbrella. Or, they might just accept the fact that Iran will be the major power broker in the region and figure out how to deal with the mullans in Tehran. Whatever the Saudis decide to do, they realize full well that the American administration is not going to do anything other than draft speeches calling on the international community to do something about Iran's nuclear ambitions. In the absence of American leadership, nothing is going to stop Iran from developing nuclear weapons. The distance between Riyadh and Washington just got a bit greater. This is an update to an article that I wrote in March. 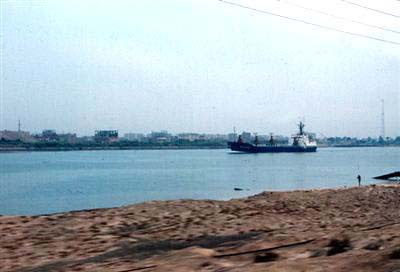 According to the Egyptian newspaper al-Usbu' (The Week), quoting Sudanese sources, an unidentified naval vessel fired on and sank an Iranian ship allegedly transporting weapons bound for the Gaza Strip. The intended recipient of the arms was the Islamic group Hamas. 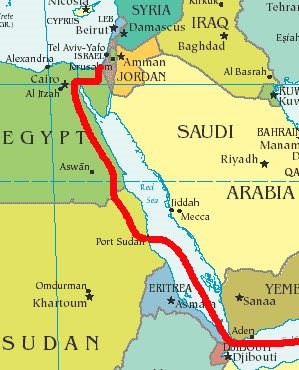 If past practice was to be followed, the Iranian ship would have docked in Sudan, the weapons offloaded for overland transport to the Sinai peninsula, then smuggled into the Gaza Strip via a series of tunnels under the Egyptian border. Given Israel's demonstrated willingness to use its air force to attack these Iranian illicit arms deliveries - it did so in March - there is no reason to believe it would not employ its small but capable navy. Israel's missile patrol boats - like this Sa'ar 5 - are easily capable of operating in the Red Sea off the Sudanese coast. 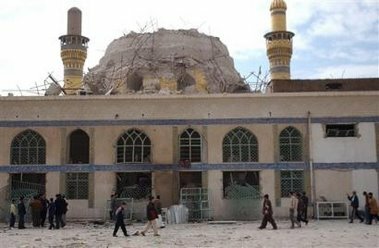 The attack Friday by Al-Qa'dah in Iraq (AQI) on the al-Kazimiyah shrine in the north section of Baghdad is a reminder that the security situation in Iraq, although improved since the extreme violence of only two years ago, remains an issue. It is also a reminder that AQI is still a threat that must be addressed if the country is going to return to some sense of normalcy - not that life under Saddam Husayn could be considered normal. 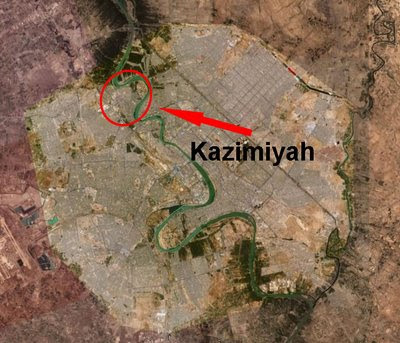 Ironically, the Kazimiyah section of the city was the venue of Saddam Husayn's execution - it took place at the former compound of the Directorate of Military Intelligence. During my time in Baghdad in 1988 as a liaison officer, I worked at this compound. AQI has suffered since "the surge" began in late 2007. It has been pretty much defeated and pushed into the Mosul area in the north. Its attacks have been focused in that area as well as areas of Baghdad. Friday's attack reveals AQI's latest tactic - try to re-ignite the sectarian violence of 2006 and 2007 that occurred after the militant Sunni AQI (then under the direction of Abu Musa'ib al-Zarqawi) destroyed the Shi'a holy site in Samarra' - the Golden Mosque that houses the shrines of 'Ali al-Hadi and Hasan al-'Askari. These two are the 10th and 11th imams respectively, grandfather and father of the 12th imam, the last imam who went into occultation as a child and will return as the Mahdi. This attack was too much for the Shi'a to take without a response. Prior to this assault, the Shi'a had observed the wishes of Grand Ayatollah 'Ali al-Saystani not to be provoked into a civil war. The Kazimiyah shrine is another holy site for Shi'a Muslims. 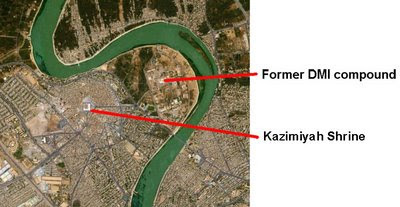 After the three holy cities common to all Muslims (Mecca, Madinah and Jerusalem), the Shi'a revere the shrines in the Iraqi cities of Najaf, Karabala' and the Kazimiyah section of Baghdad. 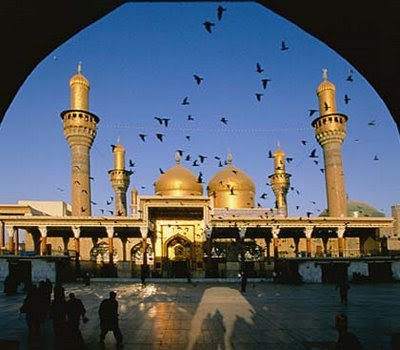 The Kazimiyah shrine houses the tombs of the Shi'a 7th Imam (Musa al-Kazim - hence the name Kazimiyah) and the 9th Imam (Muhammad al-Taqi), as well as other noted Shi'a scholars. An attack on this shrine by Sunni militants is another direct attack on the Shi'a sect of Islam. Igniting sectarian violence was a measure of desperation for AQI in 2006, and is again in 2009. AQI believes that a successful attack on Kazimiyah has the potential to restart the sectarian violence between the Sunnis and Shi'as. Of course, the Shi'a-dominated government and security forces understand the significance of this mosque and have placed it under heavy guard. AQI knows the Americans are leaving. Their only hope to achieve their aims of turning Iraq into an Islamic state is to cause a civil war they think they can win. The Iraqi government must continue the efforts started by the Americans to work with the Sunni tribes and jointly hunt down and kill the remnants of AQI. There was a little-reported story in the news today, and in the big scheme of things, understandably so. However, for those who live in the area where this happened, or those who are familiar with the geography of the area, it strikes a chord. The headline for the story was, "Palestinian police say they've uncovered explosives lab in West Bank mosque." Interesting, but not alarming - until I read the location of the mosque. The mosque (yes, a holy place of Islam, a religion of peace) is in a small city named Qalqiliyah (image below). 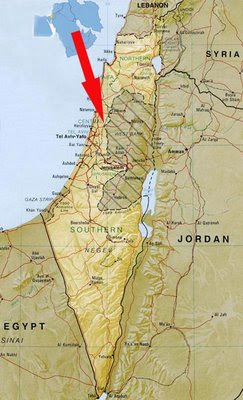 Qalqiliyah is located at the narrowest point of the state of Israel (see map below) - it is less than nine miles from this West Bank city to the Mediterranean Sea. 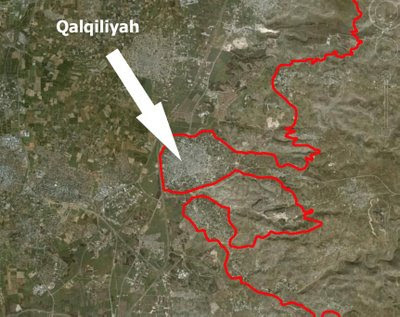 The area near Qalqiliyah has been the venue of numerous Palestinian terrorist attacks over the years because of its location. If you were going to cut Israel in half, Qalqiliyah would be the perfect place to launch an attack. It would separate two of Israel's major cities - Tel Aviv and Haifa. Why do I care? In January, I spent some time in Israel, mostly focused on the war in Gaza. During that trip, I also visited some friends in Ra'anana, Israel. 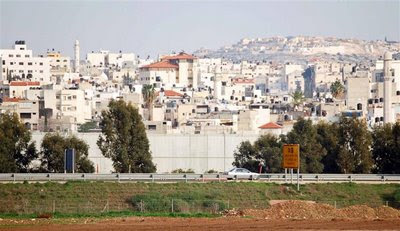 Ra'anana is located only a few kilometers from Qalqiliyah. The barrier to separate the Palestinians from the Israelis creates jaza'ir sahyuniyah (Zionist peninsulas) jutting into the West Bank. In the above image, the red line indicates the path of the anti-terrorist barrier - note the erratic nature of the fence. The barrier effectively eliminates any contact or trade between the two sides. Prior to the al-aqsa intifadhah, there was a robust commercial relationship between Qalqiliyah and the Israeli towns on its periphery. 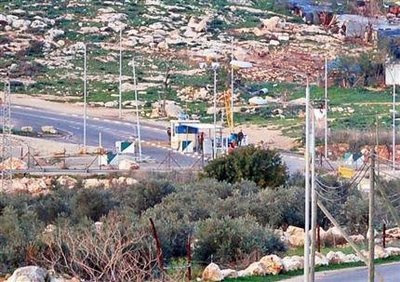 After the terrorist attacks from the West Bank and the resultant construction of the barrier, there is now virtually no contact between Israelis and Palestinians. The Israelis I talked to express regret that they cannot patronize businesses and restaurants in Qalqiliyah - I suspect that the Palestinians have suffered more economically from being cut off from Israel proper. The barrier is real. Above is a wall portion of the barrier. 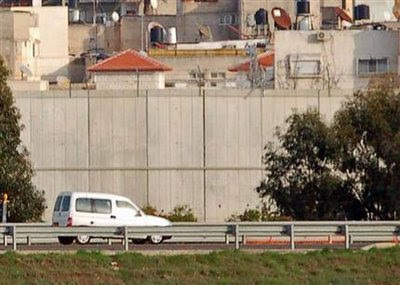 It was made a wall rather than the normal fence because of sniper attacks from taller buildings (like mosques) in Qalqiliyah. This is the gate (from the West Bank side) that controls access to the Qalqiliyah area. I was able to cross into the area on the West Bank; Israelis cannot cross here without special authorization. So who would hide weapons in a mosque? According to the police on the West Bank - loyal to Palestinian President Mahmud 'Abbas - it is most likely the Islamic militant group Hamas. I tend to agree. Qalqiliyah is a hotbed of Islamic militancy, and about as close to the heartland of Israel as you can get. Hamas has never shown any reticence about using holy places to store weapons. Since his inauguration, President Barack Obama has rapidly moved to carry out, and possibly go beyond, a campaign promise - to open negotiations with Iran “without preconditions." 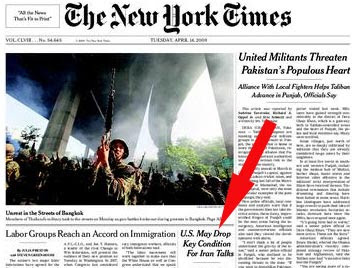 Today's New York Times reports that the "U.S. May Drop Key Conditions for Iran Talks." This is a concession to the Iranians - one that was to be expected. Soon after the new President took office, he made several overtures to the Iranians. 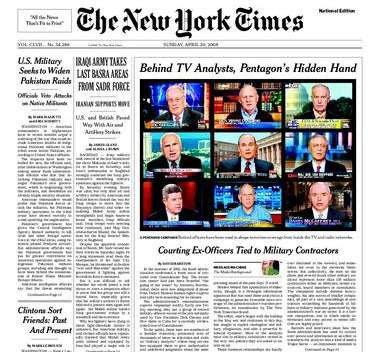 These were clumsy and amateurish - and not surprisingly, rejected by the Iranian leadership. During those first attempts to use his rhetorical skills and charm, the President unfortunately staked out a position from which he cannot do anything but make concessions. 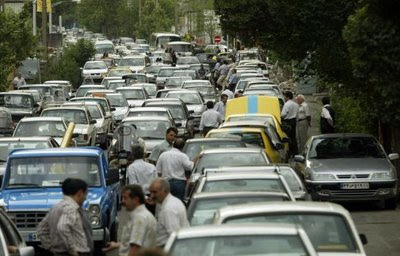 See my earlier assessment of these overtures: Memo to President on Iran and Obama and Iran - naïveté and the real world. Obama has already made several concessions to the mullahs in Tehran. He has in essence recognized the Islamic Republic of Iran and rejected the idea of supporting regime change in Iran. That, though, was not enough for either President Ahmadinejad or Supreme Leader Ayatolllah Khamenei. 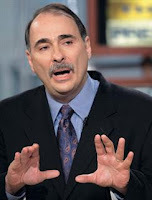 They demanded that Obama apologize for past American actions toward Iran and that he take actions to back up his words. Not to disappoint, the President is pretty much doing what they asked. While at the G20 summit in London recently, Obama criticized his own country while on foreign soil, invited Iran to sit at the table to discuss the situation in Afghanistan and agreed to participate in European-sponsored negotiations with Iran over its nuclear program. Although the criticism of past American policy was fodder for the European audience, it indicated his desire to change directions in the world. Now we read that the Obama administration may drop the demand that Iran suspend its uranium enrichment program and agree to more inspections and timeline to reduce its nuclear activities. Of course, Iran will welcome this approach, claiming that dialogue has always been the preferred option. How is this potential shift in American policy being received elsewhere? The Israelis, already leery over Obama's seeming shift away from traditional American support for the Jewish state, have labeled the new policy as acquiescence. Even U.S. congressmen from the President's own party expressed concern that Iran might use the diplomatic talks as a mechanism to gain time. That concern is valid since this is exactly how it will be viewed in Tehran: yet another concession from a naive American president that will allow us to appear reasonable and open to discussion. 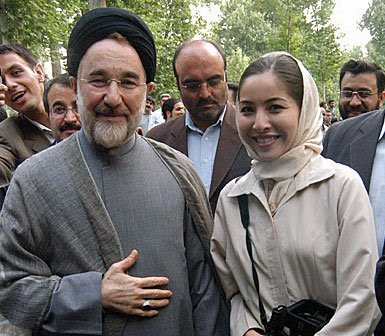 While the diplomats are talking, or talking about talking, the centrifuges at Natanz continue to spin. Here's my prediction. Just about the time the diplomats will have arrived at a "framework" for a compromise on the Iranian nuclear issue - this may take years - Iran will reveal that it has a nuclear weapon.